Here is the latest news about the Ottawa Backgammon Club. Eight players attended the December 2018 tournament. The tournament was won by Robert Loveless when he defeated Scott Douglas in the finals. It was a 2nd tournament win in a row for Robert. In the consolation, Dave Gordon defeated Paul Stebbing in the final match. Interestingly, before the tournament, the general feeling was that Robert Caldwell was almost guaranteed to be the annual champion. The script of that scenario was not respected at all. Robert had a rough day by losing his two matches while Scott Douglas reached the finals. At the end of the day, both players had the same number of points. So, for the 2nd year in a row, a playoff match was required to determine the annual champion ! That playoff match was quite exciting and well played. Scott made a great come back to win. So, for the 2nd year in a row, Scott managed to win a playoff match to be crowned the annual champion. Congratulations, Scott. Robert Caldwell also deserved to be congratulated as he had a very good year. Well done, Robert. Scott Douglas has won the annual championship for the 8th time in the history of the club. The first monthly tournament of 2019 will be played on Sunday, January 6th. The monthly tournament in February will be played on the 2nd Sunday (February 10th). The club had a good year in 2018. The attendance was excellent in the spring season with as many as 24 players registering in the June tournament and never being lower than 15 players in a month. Even if the fall season was good, it was not as well attended as the early part of the year. The club has been doing very well in the last few years. The year 2017 was excellent with a total of 185 registrations for the ten monthly tournaments. That was the best annual attendance since the early 80’s. This year, we had a total of 154 registrations and is about as good as the year 2016 when the registrations were numbered at 156. The last three years have been the best years since the early 80’s. There are 2 Backgammon Clubs in Ottawa, a weekly and a monthly. The monthly takes place at Buster's Bar and Grill, 2525 Carling ave, the first Sunday of the month at 9:45 o'clock in the morning. The weekly, every Wednesday at 7 at Big Rig on Iris street. Here are the dates for the Monthly club for 2019. The Weekly Ottawa Backgammon Club meets every Wednesday at Big Rig 0n Iris street at 6:45 pm. All levels are welcome. There is a new backgammon league starting up in Ottawa. All levels welcome! See below. 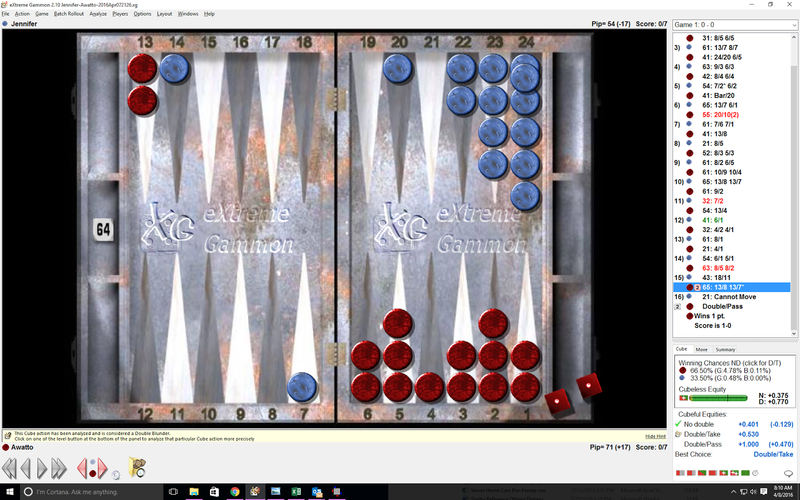 Ottawa Area Backgammon – Weekly Tournaments March 12, 2017 Dates: Every Wednesday evening starting March 22, 7:00 PM Venue: Big Rig on Iris. 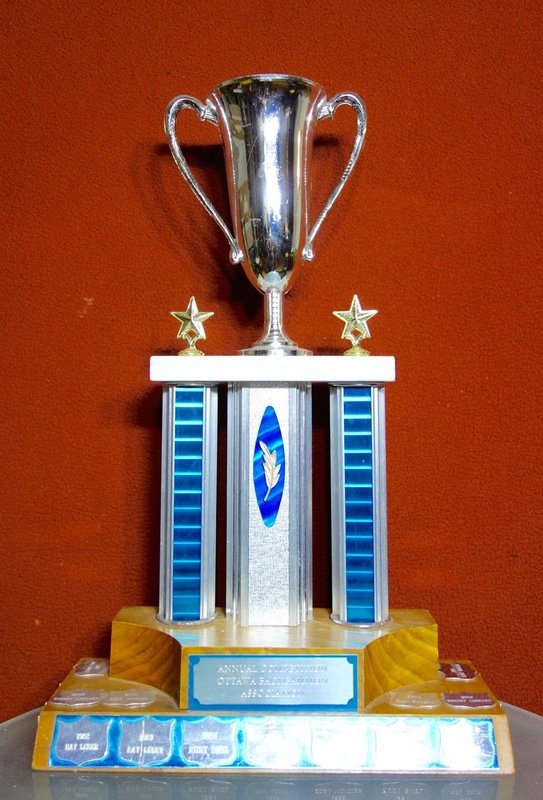 Match Length: 5 points Entry Fees: $20 entry fee with optional $20 side pool Prize Distribution: Entry Fees: 1 st – 50%, 2nd – 25%, Consolation Winner – 25% Side Pool: Farthest in Main Bracket – two thirds (2/3), Farthest in Consolation Bracket – one third (1/3) Club Points: 1 point for each win. (no points for a bye.) 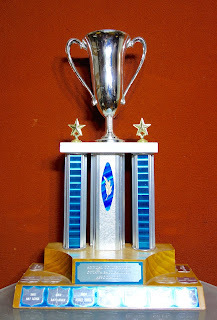 Additional (Bonus) Points for placing in the tournament – 4 points for winning the tournament, 2 points for coming in 2nd or winning the Consolation. Tournament Directors: Stuart Thomson – Cell: (613) 413-4234 Statistician: Scott Douglas Everyone is guaranteed 2 matches. Please note that the Holland rule will not be in use for these tournaments. The tournament draw will start at 7:00pm sharp. If you think you will be a little later than 7:00pm, please call my cell ahead of time so we can place you in the draw. Also, it will help the club’s reputation greatly if everyone can order some food or drinks. Ultimately the restaurant needs patrons that spend money and this includes us! This position came up and someone wanted to know why it was such a big double for red. Here's 3 responses from 3 separate members of the Ottawa BG club. Feel free to leave your opinion. 1. "I see the effective pip count as close to even with all of blue's wastage and the gap on the 4. I don't think there is any roll for red that blue has an immediate re double? You also have to look at red's 5% gammon chances where blue has no gammon chance. When red does hit, his winning chances are over 90%. When red rolls a missing number like say 5-2, he can play 13-6 with not much worry and blue doubling after that would be a big blunder. I see this as a pretty big edge for red." 2. "First of all the idea of an immediate redouble is insignificant since the cube is centered and would have been available to blue anyway. The pip count is deceptive, red has a perfectly smooth bear off. It’s better to count crossovers in the outfield and the pip count in the outfield. The crossovers are 6 to 5, with red on the roll. The outfield pip count is 26 to 29. Also, when red fails to throw a 6, he can still move off the 13 point, say with a 54, if he wants since blue’s board is not set up to contain a man on the bar. It’s a double because any hit is a loss of market. This type of position occurs often, the important thing is to know that it is a take for blue." 3. "I set up the position on gnu, and it also considers it a definite double--I would guess because of the blot in blue's home board which must involve a real gammon risk in case red hits and gets hit in return. But even when I moved that blot to the 22 point, gnu still thought it is a double, but a very borderline one." This, of course, is what all the fighting is about. The Lessard Cup! The best record over the course of a year takes her home. 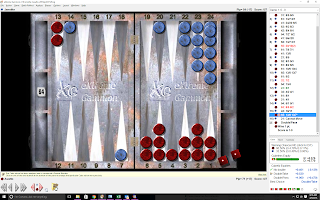 Here is the website for the Ottawa Backgammon Club: http://leaderdragon.tripod.com/bgammon.html Tournaments take place at 9:45 on the first Sunday of every month (except July and August)at Buster's Bar and Grill at Lincoln Heights Shopping Centre, 665 Richmond Road. All are welcome. You should be there at 9:30am if you want to play. Buy-in is low.